It's that time of year for the Crystal Classics team to cross the Atlantic and enjoy the hospitality that is Denver. catch up with all the mineral gossip that we all crave. 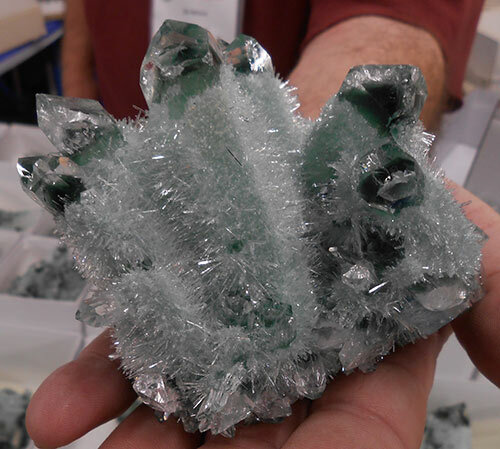 This year, as in Previous years, Crystal Classics had two rooms, 225 and 227 for the "Denver Fine Mineral Show"
a lot of the preliminary work had already been completed by the time we arrived - thanks girls. and the displays are well under way. 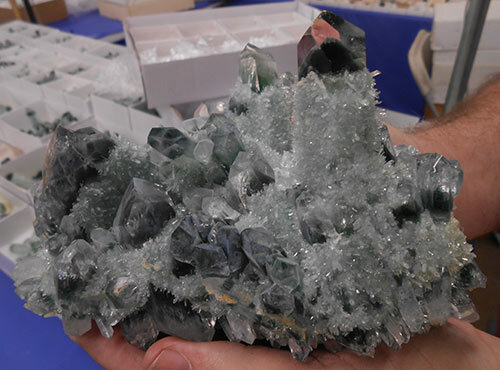 The "Denver Fine Mineral Show" being the first of our venues was the first to be set up. returned to their exact original state when we leave. the specimens to be displayed. for distribution to each of the two rooms. for this years show in Denver. for the displays in room 225.
in four show cases from around the world shown at their best. of brightly coloured specimens to suit their particular interest. to locate the specimens that particularly interest them. In room 225 are some of our finest specimens - here are some of them. the piece you like might be still available and we can reserve specimens for you! the Otjua Mine, Otjua Farm 37, Karibib District, Erongo Region, Namibia. Córrego São Francisco, Cury, Almenara, Minas Gerais, Brazil. the Novello Mine, Masvingo (Fort Victoria), Masvingo, Zimbabwe. showing high surface lustre - a must for any gem mineral specimen collector. Serra das Éguas, Brumado (Bom Jesus dos Meiras), Bahia, Brazil. together with pure white "flowers" of Albite Var. "Cleavelandite"
Baltistan, Gilgit-Baltistan (Northern Areas), Pakistan. New Idria District, Diablo Range, San Benito Co., California, USA. - from Round Mountain Gold Mine, Toquima Range, Nye Co., Nevada, USA. Eagle's Nest Mine, Sage Hill, Michigan Bluff District, Placer Co., California, USA. amidst a cluster of pure white to colourless pointed crystals of Quartz. Huayllapon Mine, Pasto Bueno, Pampas District, Pallasca Province, Ancash Department, Peru. from the Blanchard Mine, Bingham, Hansonburg District, Socorro Co., New Mexico, USA. Sweet Home Mine, Mount Bross, Alma District, Park Co., Colorado, USA. Fresnillo, Mun. de Fresnillo, Zacatecas, Mexico. 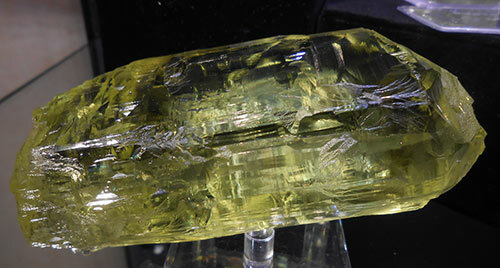 First a lovely pencil point, yellowish green, lustrous Vesuvianite. Typical habit for the Locality. ....and this smaller, but just as gemmy group, with a few tiny black Chromite inclusions. from Ojuela Mine, Mapimí, Mun. de Mapimí, Durango, Mexico. Bisbee, Warren District, Mule Mts, Cochise Co., Arizona, USA. 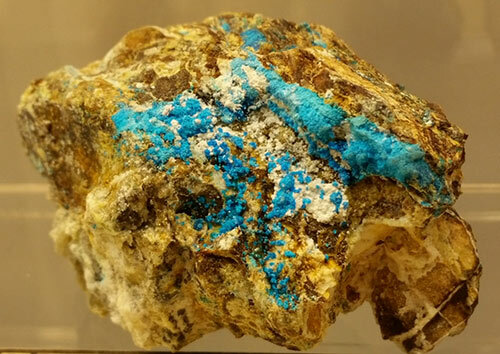 from Mammoth-Saint Anthony Mine, Tiger, Mammoth District, Pinal Co., Arizona, USA. Old Yuma Mine, Saguaro National Monument, Amole District, Tucson Mts, Pima Co., Arizona, USA. from Bristol, Hartford Co., Connecticut, USA. Old Labels accompanying the Chalcocite pictured above. Jenipapo district, Itinga, Minas Gerais, Brazil. 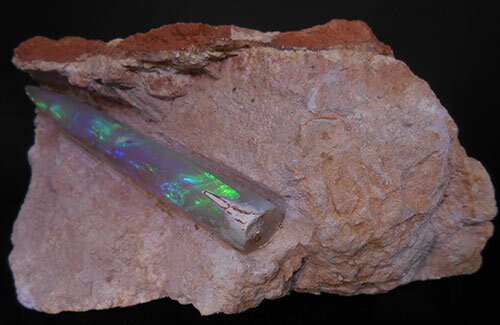 from Bisbee, Warren District, Mule Mts, Cochise Co., Arizona, USA. Amelia Mine, Boleo District, Santa Rosalía, Baja California Sur, Mexico. from Mammoth Mine, Mammoth, East Tintic Mts, Juab Co., Utah, USA. from the Mésage Mine, Saint-Pierre-de-Mésage, Vizille, Isère, Auvergne-Rhône-Alpes, France. of light blue Plumbogummite from Roughton Gill Mine, Caldbeck Fells, Cumbria, England, UK. Camborne - Redruth - St Day District, Cornwall, England, UK. from Herodsfoot Mine, Lanreath, Liskeard District, Cornwall, England, UK. St Day, Redruth, Gwennap, Cornwall, England, UK. Wolf Mine, Herdorf, Siegerland, Rhineland-Palatinate, Germany. Mercur Mine, Bad Ems, Lahn valley, Rhineland-Palatinate, Germany. 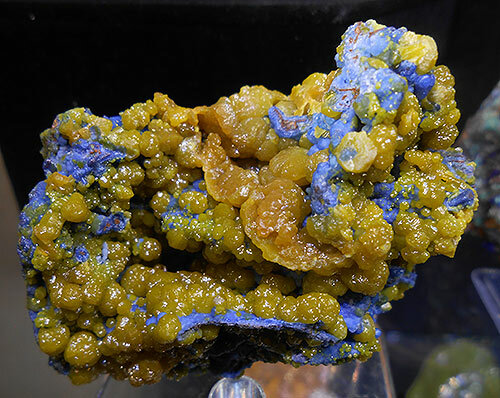 from Sauberg Mine, Ehrenfriedersdorf, Erzgebirge, Saxony, Germany. Lingqiu Co., Datong Prefecture, Shanxi Province, China. Coober Pedy, Central North, South Australia, Australia. Volodarsk-Volynskii, Zhytomyr Oblast' (Zhitomir Oblast'), Ukraine. Democratic Republic of Congo (Zaïre). 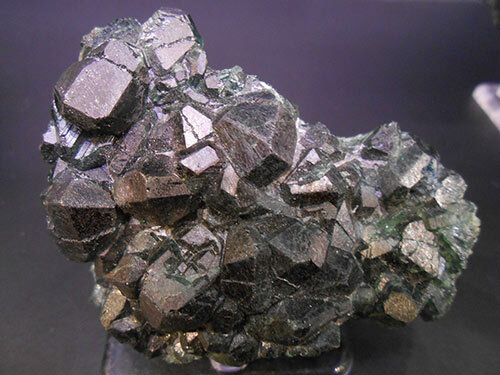 from the Tsumeb Mine, Tsumeb, Otjikoto Region (Oshikoto), Namibia. Tsumeb Mine, Tsumeb, Otjikoto Region (Oshikoto), Namibia. Pale Baryte crystals partially embedded in velvety banded green Malachite. Katanga (Shaba), Democratic Republic of Congo (Zaïre). Kalahari manganese field, Northern Cape Province, South Africa. Bou Azzer District, Tazenakht, Ouarzazate Province, Drâa-Tafilalet Region, Morocco. 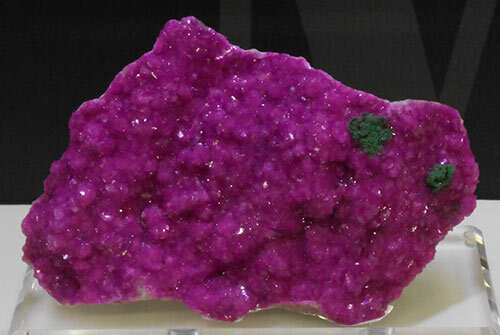 from Ogonja (Onganja), Seeis, Windhoek District, Khomas Region, Namibia. dealing with clients but we were able to escape to see a little of what some of the other dealers had to offer. As always their collection was worth a look. Here are a few of the things they had on display. A fine large cut and polished slice of banded Rhodochrosite from Argentina. showing numerous grains of Olivine from Imillac, Chile. Tsumeb Mine, Tsumeb, Otjikoto Region, Namibia. 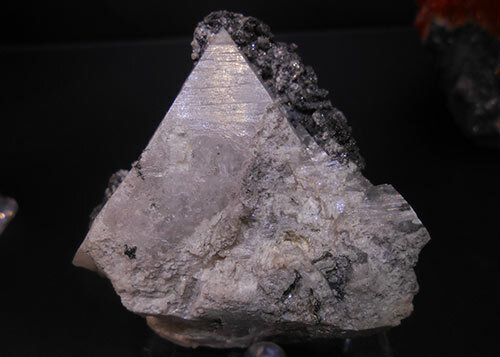 a pocket of creamy Stilbite from Jalgoan District, Maharashtra State, India. Of note was this Currierite (named for the Late Rock Currier). El Tamarugal Province, Tarapacá Region, Chile. Urucum Pegmatite, Galiléia, Minas Gerais, Brazil. 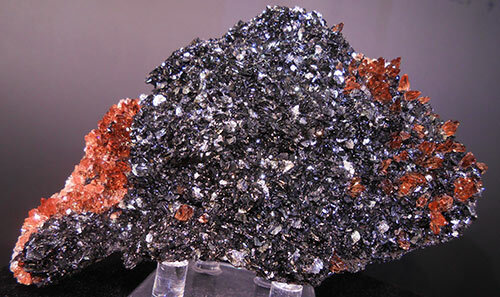 from the Capillitas Mine, Andalgalá Department, Catamarca, Argentina. the Democratic Republic of Congo. 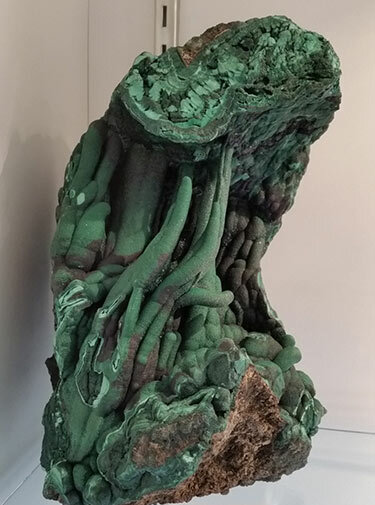 A closer look at the Malachite pictured above. the Sapo mine, Ferruginha, Conselheiro Pena, Minas Gerais, Brazil. Sillimanite from Orissa, India and Amblygonite from Brazil. Malenco Valley, Valtellina, Sondrio Province, Lombardy, Italy. Enguidanos, Cuenca, Castile-La Mancha, Spain. was a treat for the enthusiast. from the Goboboseb Mts, Brandberg Area, Erongo Region, Namibia. team was split so that we could transfer stock and start the set up at the main show at the Denver Mart. We had reserved a lot of our stock for the showcases at this show and again the preparation began. A view of part of the main hall at the Mart. Cal Graeber and Leonard Himes setting up their booth. Some of the many Exhibition show cases in the process of assembly. Dealers cover their stand at the end of a days work. (Needless to say, these are all replicas). A display put on Penny Williamson and Paul carr of the University of Wollongong. One of the large Dinosaur models to be seen at the show. set out down corridors where dealers can have a more private area. Crystal Classics had a large room down one of the corridors. Liz and Dave - Mid preparation. Visitors milling around the Crystal Classics Booth. Lanzo Valleys, Torino Province, Piedmont, Italy. St Andreasberg, St Andreasberg District, Harz, Lower Saxony, Germany. District of Kosovska Mitrovica, Kosovo. A great piece from Brazil. A large single terminated Quartz crystal with a skirt of Rose" Quartz crystals around the middle. A fine example from Laranjeira, Minas Gerais, Brazil. both from purely exhibitors wanting to show collections to dealer showcases. "Amateur Rockhounding - The First Four Years"
...and a selection of Amazonite with "Smoky" Quartz from Colorado. The process of assaying the Gold included a blowpipe testing kit. Capillitas Mine, Andalgalá Department, Catamarca, Argentina. Highly detailed carving of an Octopus. Not sure What kind of stone this was carved from - perhaps a kind of Agate. A selection of books and magazines on the "Rocks & Minerals" stand. on the Superb Minerals India stand. A fine spray of Scolecite crystals from india. also on the Superb Minerals India stand. Chenzhou Prefecture, Hunan Province, China. from La Marina Mine, Mun. de Pauna, Boyacá Department, Colombia. One of the many collections of Thumbnails on show. A closer look at the detail in one of these cameos. 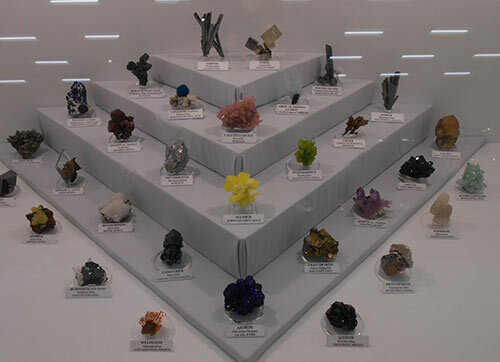 The colourful display of the Mineralogical Association of Dallas. from the Katanga Copper Crescent, Dem. Rep. of Congo (Zaïre). nice specimens that most collectors would wish to add to their collections. were convincing enough, if it had not been for the green colour which was a little too rich. and produced in China and very attractive they are. The chinese I understand are passing them off as having been "heat treated" natural Quartz. 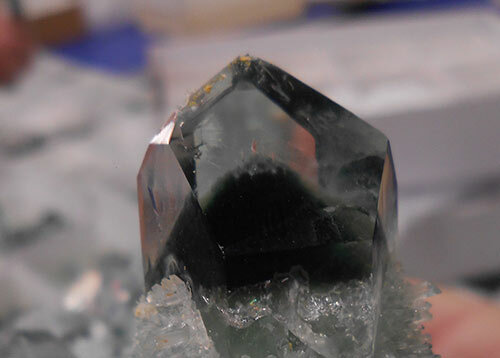 A close up of the "Phantom visible in the tip of these Quartz crystals. ... perhaps not so convincing. - certainly we have not seen anything like this from any natural source!! but very attractive to the eye. bearing minerals from around the world. Detail of one of those Silver specimens from Germany. and a close up of some of those Tourmalines. Ay, Ay. 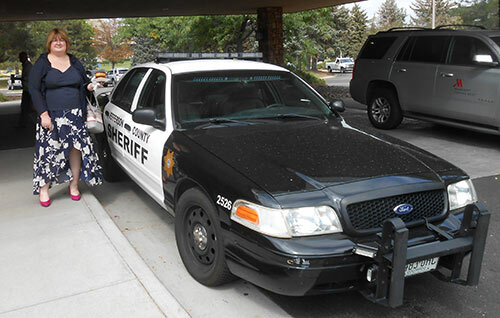 Debbie has another brush with the local law!! Well that's it for another Denver. at the Denver show this time next year 2018. And now we return to East coker to prepare for Munich. with new collections not previously seen.